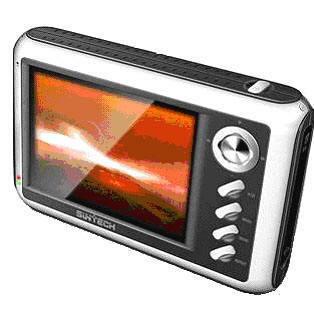 MP4, MP3, Video Player, Video Recorder, Music Player, Image Viewer, Plays Games, and much more.. It can record from your TV, VCR, and DVD player by kinescope card, cable or satellite box. Make scheduled recordings Store up to 50 hours of video, 40 movies,5000 songs or 200,000 photos Transfer photos directly from your PC using the USB host port Play MPEG-4 files Play TV recorded shows, movies and home videos on a 3.6” color screen, your TV or any external screen. Music recording from an analog source in stereo sound for MP3 format. Games:8,16 and 32 bits multi layers game is available for all models, Based on powerful multimedia processor, even 3D game can be performed so good out of your imagination. E-Book: Not just TXT files, PDF and WORD will be supported. Photo viewer: JPEG,GIF and BMP.Download photos from computer through USB 2.0 port. 480Mbps data transfer speed via USB2.0, compatible USB 1.1, PC & Mac. USB Host port compatible Mass Storage Device. Power source Internal: Rechargeable Lithium-Ion Battery-2500mA. External: AC charger/adapter 110-220 V AC input, 5V,2.5A DCinput. Special: The first 100 purchases will receive a $20 discount.